The Dog's name was Rex. Rex was a recipient of GOC-in-C Commendation Card for his outstanding & exemplary performance against militants. 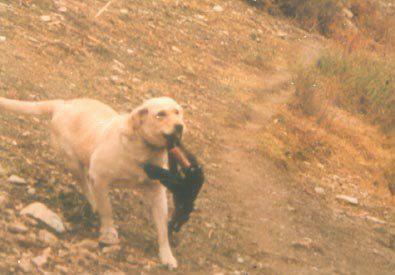 The 9A 92 Rex, a golden Labrador was born on 25 February 1993 at RVC Centre & School Meerut. After a year's training, he was posted to 14 Army Dog Unit under Delta Force and assigned the areas adjoining the town of Bhaderwah, to help troops in trailing & tracking militants. In March 1995, operating with troops of 25 RR in jungles of Badrot, South of Bhaderwah, he tracked a militant injured in an encounter for over 3 km in the thick of militant fire. In a chase that lasted for over four hours, he managed to recover one AK 56 rifles and an haversack containing 92 rounds. In April 1998, out on a patrol in area Gulgandhar, security forces killed two dreaded militants and badly injured one, who managed to escape. Picking up the scent of his blood, 'Rex' went hot on the trail and moved speedily & stealthily over strenuous undulating mountains. After tracking over 2 km, he succeeded in tracing out the body of the militant in a hideout where he had succumbed to his injuries. Let out on yet another 'trial' with the QRT of CO 25 RR in Daraba near Rajouri, Rex suffered an unfortunate fall and sustained serious intestinal injuries. He was evacuated to the nearest Army Veterinary Hospital where he developed acute gastroentrities and finally succumbed on 22 September 1999. DID HE DESERVE MORE ?